Michael Rahn and Marion Foy were dressed in their Opening Day tailgate-best. Red tutus, capes, you get it. 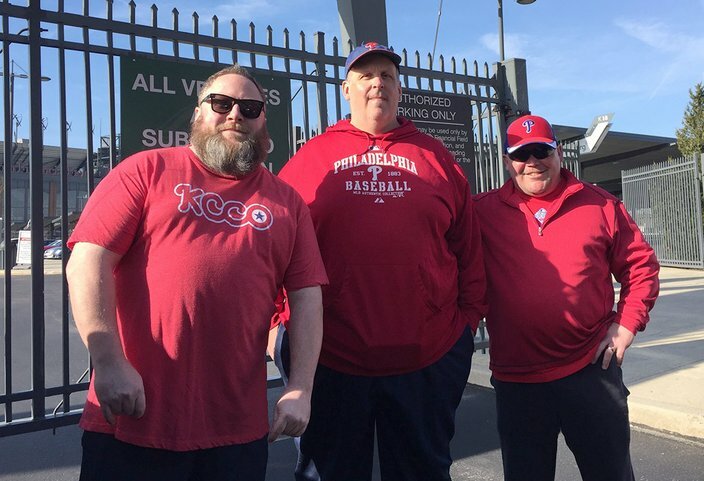 Foy said Rahn — the nephew of the original Phillie Phanatic — is a huge Philly sports fan. When you hear he dressed in a Chewbacca costume with an underdog mask for the Eagles parade, it makes sense. His upbringing plays into the consuming penchant. How couldn’t it? Foy, of South Philly, just laughed as her best friend posed for more pictures. Are there any drawbacks for the recently turned 30-somethings? “I just haven’t figured out how to pee in these costumes yet,” he said. 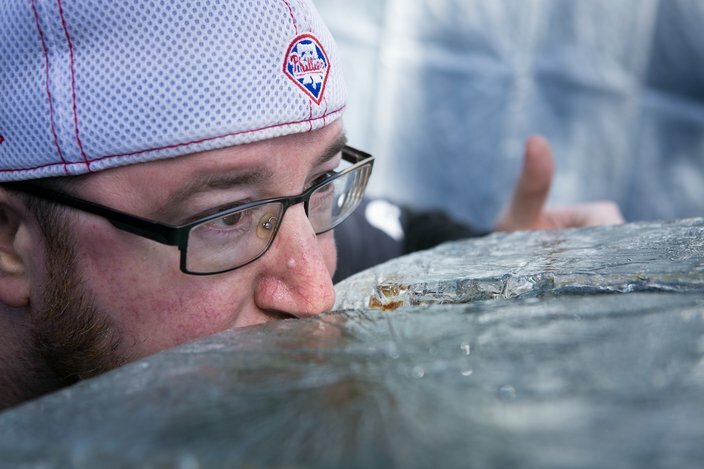 Chuck, (of Duck and Chuck) of the Jetro M5 tailgate group does a Jagerbomb from an ice luge while tailgating before the Phillies Home Opener, Thursday, March 28, 2019. Duck is from Delco. Chuck is from Delanco. Together, they’ve put on one hell of a tailgate. It started in 2000 with Eagles games. Thursday was their 7th Phillies Opening Day event. “It’s evolved every year, with more and more people,” they said of an event that’s garnered second-best honors from a local TV station. They have a private Facebook group — Jetro M5 Tailgate — through which attendees can coordinate the food and drinks they’ll bring. Lobster. Steak. The good stuff. They also have an “ice luge” for the harder spirits. They get the 300-pound block from Mack the Ice Man in Runnemede. It was stained with Jagermeister by 11:30 a.m.
Today, as DJ Smooth’s tracks echo throughout the Jetro lot, they’re expecting 200 attendees. “We don’t charge a penny, and we’ve never had any problems, no fights,” Chuck proudly declared. “Peace, sports and love,” is how Chuck’s wife, Beth, described it. And that’s the feeling in the air. Opening Day has special meaning for Phillies fans Nick and Meghan Niedosik, seen tailgating on Thursday morning outside Citizens Bank Park. They met on an Opening Day and then married on an Opening Day. Nick and Meghan Niedosik just LOVE Phillies Opening Day – and for good reason. They met on Opening Day. They married on Opening Day. And every Opening Day they celebrate their anniversary. Seven years ago, Mick’s in Port Richmond ran a bus trip to Opening Day. Nick is too good for bus trips though, so he drove down to the ballpark, where he would meet Meghan. 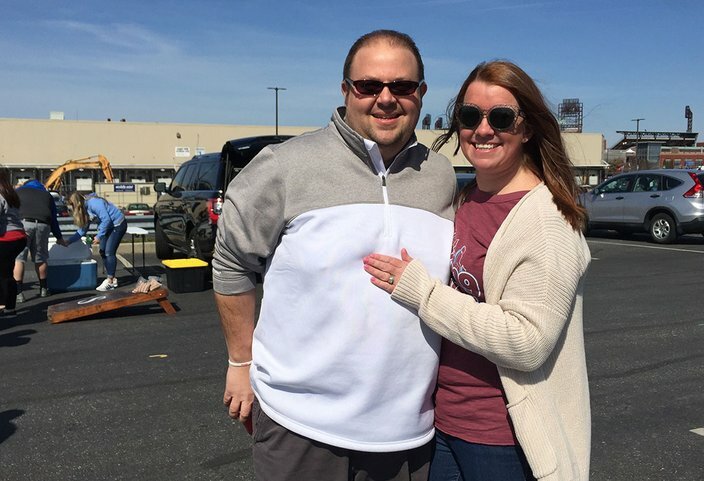 Three years later on Opening Day, the couple would marry – though not at a tailgate in the parking lot near the Phillies stadium. But still each Opening Day they celebrate their wedding anniversary. Meaghan has only missed two home openers because she was pregnant with their children. She doesn’t mind that, since she said she is most certainly not about drinking while pregnant. “We went back to Mick’s after the game,” said Nick recalled of the day they met. “He walked me home. We kissed and started dating,” added Meghan. The rest is Phillies Opening Day romantic history. “We love Opening Day,” she said with a smile bright enough to light up the ballpark. 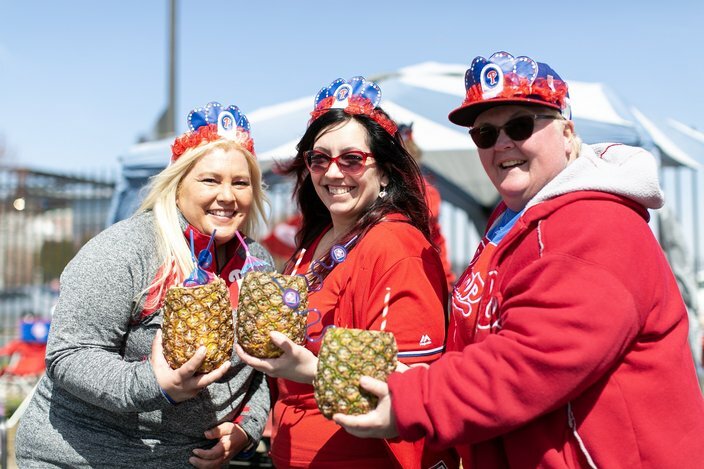 Phillies fans, from left, Michelle Mellor, Gina Lucano and Kathy Nolte have an early morning beverage after setting up their tent in a parking lot for Phillies Opening Day. They were sipping a Fireball concoction from hollowed-out pineapples. The Jetro lot was about two-and-a-half hours away from its 10 a.m. opening, but Gina Lucano, Michelle Mellor and Kathy Nolte had more important things to do than wait. So they loaded up carts and brought tents and chairs and Fireball-soaked pineapple slices along with Fireball-prepared fudge and pineapples hollowed out to serve as drinking cups. The three friends have been coming to Opening Day since the days of Veterans Stadium as well. They’ve seen the crowd size rise and fall with the fortunes of their team. They get the sense that this year is going to be bigger than ever. “There’s a lot of Harper Hoopla. I came up with that phrase myself,” Lucano laughed. “Everybody watched us setting up like we were crazy, wheeling our carts around the lot, sliding the tents through the fence, but it didn’t take too long for them to start doing it, too. Brothers Stephen and Austin Barcoski have a catch with a tennis ball behind the Jetro lot. 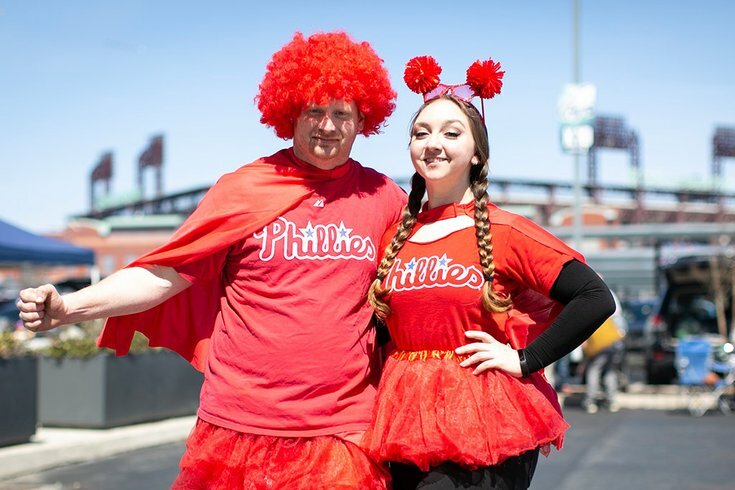 They've been to a lot of Opening Days at Citizens Bank Park. Stephen and Austin Barcoski are having a catch with a tennis ball behind the Jetro lot just before 11 a.m. Even though they’re nine and eight, respectively, their parents Steve and Jackie estimate it’s their sixth or seventh Opening Day tailgate. “We learned a hard lesson about bringing baseball. Too many cars hit,” said Steve. “A little bit, ya think?” said Steve when asked if there’s more excitement this year. The conversation was cut short when a tennis ball went sailing past him and into a neighboring tailgate. No cars were damaged. 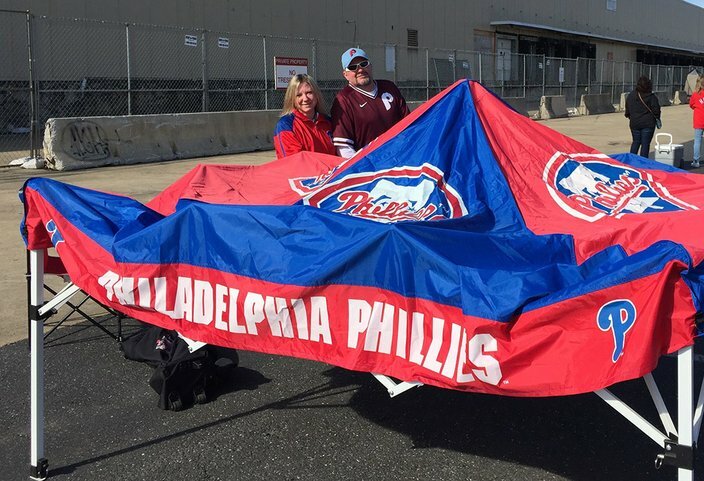 Wilkes Barre fans Julie Innamorati and Tom Hufford set up their Phillies tent before cars are let into the Jetro lot along Pattison Avenue in South Philadelphia. Just before the gates to the JETRO lot were opened, Julie Innamorati and Tom Hufford were setting up their Phillies tent with a birds-eye view of Citizens Bank Park. They had left Wilkes Barre at 7:20 a.m. and their friend is waiting in line in a car but they wanted to get inside first to get set up before the cars came rolling through the gates. They’ve been tailgating on Opening Day for three or four years and were asked whether they sensed more excitement than previous years. “I’m hoping so,” Hufford said. “They made some very good additions this off-season." “He’s very excited,” Innamorati noted. Stumpy Coles packed his truck up in Bucks County and hit the road around 6:30 a.m. Thursday. That’s how he came to be the first person in line outside a still-closed parking lot an hour later. He’d soon be joined by his buddies Mike Costello and Matt Bendzyn. 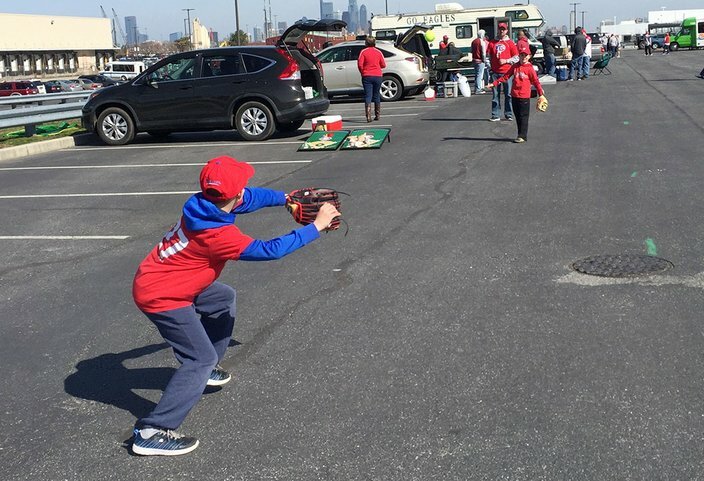 They started their Phillies tailgate tradition some 17 years ago when the team still played at the Vet. They could barely contain their excitement as they prepared to set up a barbecue spread that would include filet and shrimp, pulled pork and mac & cheese, and so many other offerings that it became difficult to even write them down as they spoke. There’s good reason for this. “It’s exciting. This is a historic day in Philadelphia,” Coles said of a group that comes from across the region. Bendzyn recalled the Opening Day when Roy Halladay pitched against the Nationals. Costello said the only two home openers topping the anticipation of today's game were the last one at the Vet and then as defending World Series champs. “Today just feels special,” added Costello. “I can’t wait to get inside and start setting up.